A bomb blast aboard an Istanbul bus Thursday killed at least three people and injured eight others, a senior police official said. It was the second explosion in Turkey ahead of a visit this weekend by President Bush and next week's NATO summit. The explosion occurred as the bus was traveling in a residential area of Istanbul, the official said, speaking on customary condition of anonymity. Ambulances were seen rushing to the scene. 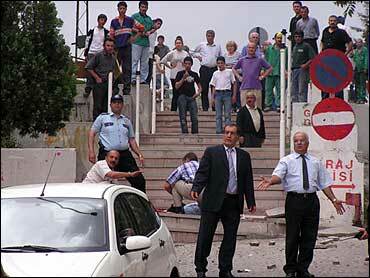 Earlier Thursday, a small bomb exploded in front of the Ankara hotel where Mr. Bush is expected to stay this weekend. Three people were injured, including two police officers. Separately, gunmen briefly seized the Turkish Airlines office in the Georgian capital of Tiblisi. Mr. Bush is among a number of NATO leaders, including British Prime Minister Tony Blair and French President Jacques Chirac, who are to attend the summit that starts Monday. The Istanbul blast took place in the Fatih district, some five miles away from the summit area. Hospital workers with stretchers were seen rushing to the scene. Murat Gulen, a pharmacist whose shop is across the street from the blast, said he heard a huge explosion. "I saw the bus, its windows broken. People on the bus were in a panic. They were trying to escape and the driver was struggling to open the door," Gulen said. Witness Necdet Devrin told NTV television that he saw "injured people on the floor. They were screaming and bleeding. Arms and legs were on the street — it was an awful scene." Ankara Police Chief Ercument Yilmaz said officers in the Ankara blast were injured when they approached a package containing explosives to verify an anonymous tip that a bomb had been placed nearby. One officer lost a foot in the blast, said Adil Surat, head of the trauma unit at Hacettepe University hospital, speaking to the Anatolia news agency. A second officer had scratches on his face and appeared to be in shock. He was in good condition, as was the civilian, Surat said. A small Marxist group, MLKP-FESK, claimed responsibility for the Ankara blast, private NTV television reported. Police would not comment on the report. The Ankara bomb exploded some 75 yards from the entrance of the hotel, shattering windows of nearby buildings. Mr. Bush is scheduled to arrive in Ankara late Saturday night and is to meet Prime Minister Recep Tayyip Erdogan and President Ahmet Necdet Sezer on Sunday. White House spokesman Scott McClellan says it appears "these attacks are intended to disrupt preparations for the upcoming NATO summit, which is a gathering of free nations united in a global fight against terrorism." But in terms of Mr. Bush's schedule in Turkey, McClellan says "nothing has changed." Turkey is a majority Muslim country that has mainly hewed to a secular form of government, enforced on three occasions by military coups. Militant Islamic, Kurdish and leftist groups have carried out past attacks in Turkey, and scores of people believed to be linked to such groups have been detained in security sweeps in recent weeks. Concerns about security have grown in Turkey since last November, when four suicide truck bombings killed more than 60 people in attacks on two synagogues, the British consulate and a London-based bank. Prosecutors say a Turkish al Qaeda-linked cell carried out those attacks. About a half-dozen small sound bombs — explosives designed primarily to make noise and not cause serious damage — have exploded in Istanbul in recent days. Leftist groups have used the bombs in the past. Several people have been injured, most by shattered glass. Security in Istanbul is expected to be extremely tight for the NATO summit. Turkish security forces are using concrete barriers to seal off a zone in the heart of the city and surveillance aircraft are being prepared to help monitor a no-fly zone over the area. The Bosporus will also be closed to oil traffic ahead of the summit.